One of the most beneficial things you can do to maintain the health of your hair is to cover it at night. 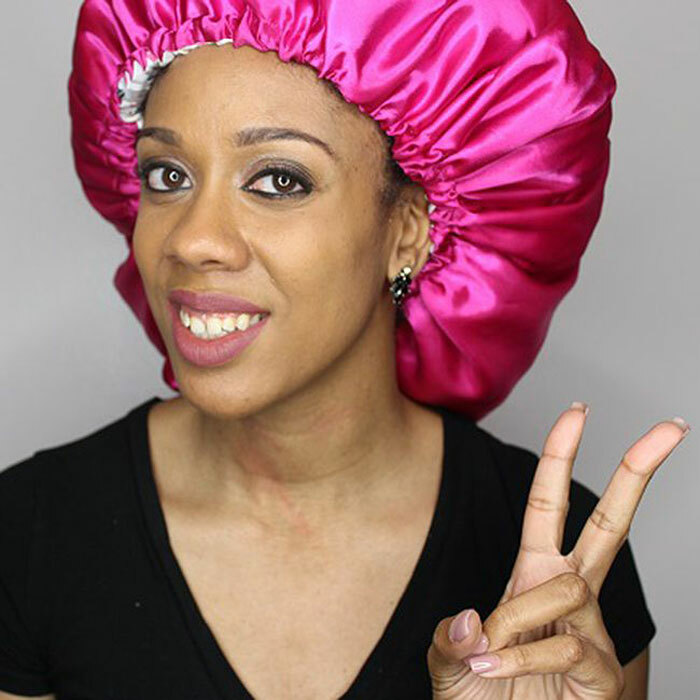 Whether you wrap it with a scarf or don a bonnet, protecting your hair from your bed sheets is important. You may be unaware, but your cotton bed sheets are leaching the moisture right out of your hair when you sleep at night. So when you moisturize before bed and lay your head to rest, you could wake up with dry frizzy hair. Also the friction between your strands and the cotton fibers could cause damage. Now that you know of the benefits of covering your hair at night, the quick fix would be to go down to your local beauty supply store and pick up one of their satin scarves or bonnets. While those are the easy solution, they are not the best. Many of us have been lead to believe that these products have been made from satin but they are not. Instead they have been manufactured with cheaper nylon. This deception is very reminiscent of products that claim to have amazing ingredients but are padded with cheap fillers like mineral oil and petrolatum. While nylon is not detrimental to your hair, it doesn't provide the adequate protection it needs. The nylon used has a very loose weave which means that there are lots of gaps in the fabric where the moisture can escape as opposed to real satin that is created with a much tighter weave. The difference is very evident when the two fabrics are held up to the light. Nylon appears to be semi transparent as it allows a lot of light to peek through, whereas real satin, which is woven more tightly, should block most if not all of the light. Also, in terms of creating a smooth surface to prevent friction, nylon cannot hold a candle to the real satin. Lastly and most importantly, real satin is far more durable than the fake satin. I’m sure many of you out there can relate to having to buy several scarves and bonnets because they quickly tear and get damaged. This is a testament to the low quality of the material. Real satin, however, is a sturdier fabric that is not easily stretched or torn. Because of real satin’s superiority, it's more expensive than the fake. To some this may be a deterrent, but as my mother always says, cheap things are not always good, and good things are not always cheap. Now that you curlies know the difference, the choice is up to you as to which scarves and bonnets you want to invest in. Since experiencing real satin I simply cannot go back. When I wake up my hair is softer and more moisturized. I may just be seeing things, but my edges also seem to be in better shape too. I made the switch, so the question now is, will you? Also, if you have already made the switch, did you notice a difference in the health of your hair? Feel free to share below.